Ubranisation, a migration movement from countryside to the city. It won’t take long before all the cities are overcrowded and green spaces will disappear. BUT! There are solutions like the Envision Green Hotel. The Envision Green Hotel takes living and green spaces literally to the next level. 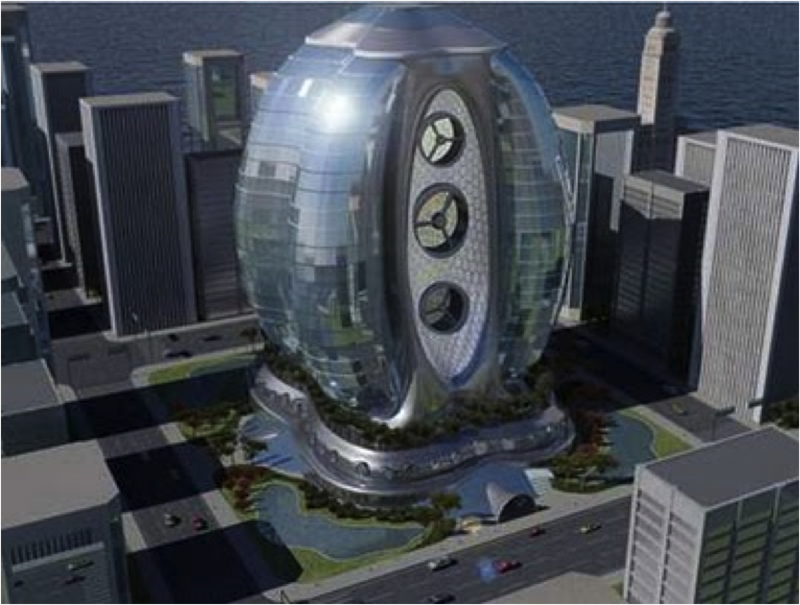 The Envision Green Hotel is an egg–shaped skyscraper designed for the Hospitality Design Radical Innovation design competition. This tower will be used as an urban eco-resort and as a wind tower. The tower is seen as a living organism, and therefore natural air will flow through the building. By solar the tower will be provide with electricity, the courtyards provide indirect insulation and the swimming pools serve as decorative fire protection. The Envision Green Hotel is an upward extension of the earth and it contributes to the Quality of Life because even though you are high up in the sky you still can experience all of the earth-eco-aspects. All of this is exactly why the Envision Green Hotel is sow innovative and cool.